I can’t believe how quickly Christmas has come around this year, either the years are shorter or I’m getting older. I am determined to get all the present shopping done early this time so I can miss all the crazy chaos at the mall, lets see if that actually happens! Perhaps I could just resort to online shopping instead. 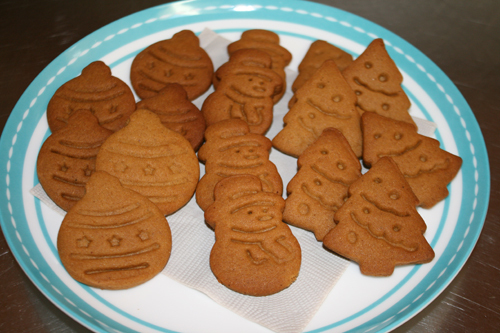 In the spirit of the Christmas season, my girls and I decided to bake and decorate some gingerbread biscuits. It was a fantastic way to keep them occupied for a while and also worked on their fine motor skills, very important for little hands. 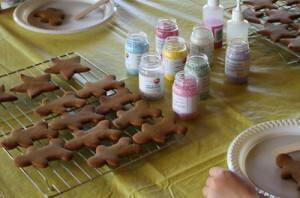 After the biscuits had baked and cooled we got busy with icing (coloured using Natural Colourful Food Colouring, naturally!) and our lovely 100’s and 1000’s. I had cut and punched some Christmas shaped biscuits which were left plain, and have since discovered they are quite moreish. Below is the easy and yummy recipe we used. For the icing on our biscuits I just used water, icing sugar and food colouring because I’m avoiding raw eggs at the moment, but I have included the proper royal icing recipe below. Preheat oven to 160°C and line your baking trays with baking paper. Beat the butter and sugar until pale and creamy. Beat in the treacle and egg yolk. 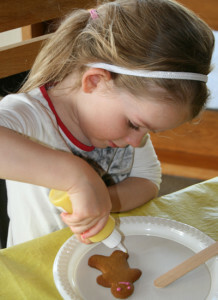 Sift the flour, spices and baking soda over the creamed mixture and combine. 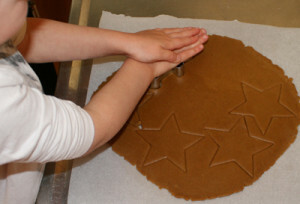 Once the dough has rested roll it out between two sheets of baking paper until it’s about 4mm thick. 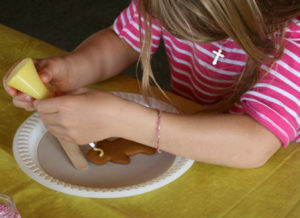 Cut shapes out using cookie cutters and place biscuits onto baking trays, leaving a little space between each biscuit. Bake for about 15 minutes until the biscuits are a nice golden colour. Allow to cool slightly on the baking trays before transferring to a cooling rack. To make the icing place the egg white in a clean, dry bowl. Slowly add the icing sugar and continue beating until the peaks become stiff. If you wish to colour the icing this can be done now. Keep the icing covered with glad wrap until ready to use. This stops a crust forming on the top. Once the biscuits are cool the icing can be spread or piped on top and for added decoration 100’s and 1000’s or lollies can be added. When the icing is dry store biscuits in an airtight container.